This astrolabe has an unusual design. Instead of the customary form of mater, there is a single flat plate projected for the latitude of Oxford, with a degree scale on the limb. There are no alternative plates and the 'Y' pattern rete is held by a rivet. The astrolabe, which belongs to Oriel College, may be associated with the group of mathematicians in 14th-century Oxford known as the 'Merton School'. It may have come to the College among the astronomical instruments bequeathed to Oriel by the astronomer Simon Bredon, who had been a Fellow of Merton in about 1330. 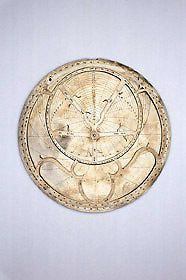 As a 14th-century astrolabe made for use in Oxford, it is of great historical interest.